There are many other species of indigenous bees in southern Africa besides the ubiquitous honeybee Apis mellifera which is today essential for the pollination of many introduced food crops. The large carpenter bee (Xylocopidae) which fills the same niche in southern Africa as the bumble bee does in Europe is fairly obvious as it flies about trees in flower such as the keurboom (Virgilia oroboides). 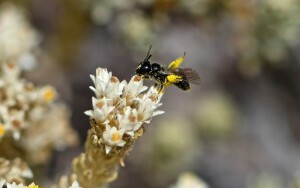 Yet there are many other species of much smaller solitary or sub-social bees that play an important role in the pollination of indigenous vegetation. One such interesting group of bees belong to the Allodape and closely related genera which are generally referred to as ‘allodapine bees’ to distinguish them from members of the genus Ceratina or lesser carpenter bees. Allodapines are found in Asia and Australia but are most abundant and diversified in Africa south of the Sahara. What distinguishes them from other such bees is that they have no partitioning cells in their nests and brood is reared in a single burrow and the larvae are fed progressively with small amounts of nectar and pollen made into a paste. 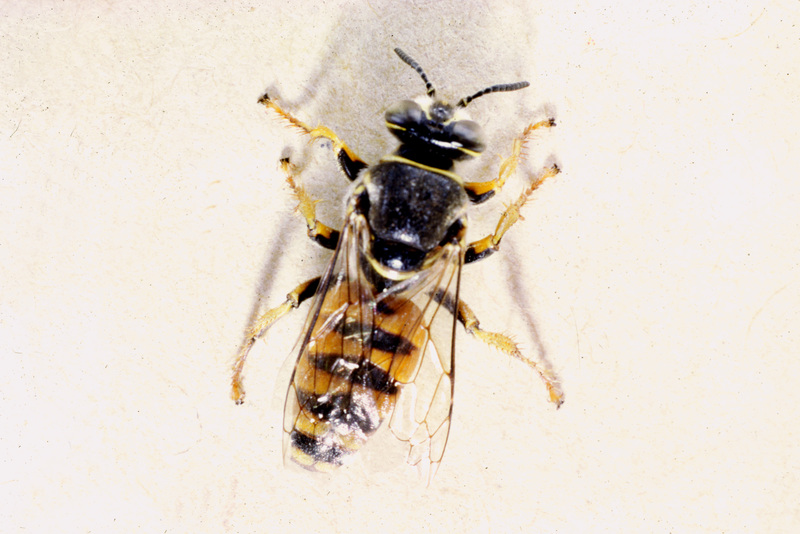 Allodapine bees are usually brown or black with the largest species about 15mm long, but they all have yellowish facial markings either as thin lines or a patch in the lower centre of the face. They construct their nests in hollow or pithy dead stems, especially where the stems have been broken or burnt to expose the pith. 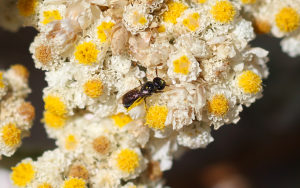 The abundance of nesting sites has a great influence on populations of allodapines and large numbers are able to build up in areas where there are regular nesting sites. Large numbers of allodapine bee nests could, for example, be found in dead khakiebos (Amsinckia calycina) stems alongside railway tracks in KwaZulu-Natal in the 1970’s. Khakiebos was accidentally introduced into South Africa from Chile in fodder purchased for horse feed during the Anglo-Boer War and the weed followed wherever the British mounted troops went. The practice was to spray herbicide on either side of the railway lines to prevent the encroachment of weeds onto the tracks, and this often caught fire and so formed an ideal nesting site for these bees. A small trial showed that a major limiting factor was the number of broken khakiebos stems available for nesting. The number of nests could be greatly increased with the artificial cutting of unbroken stems, so creating access to the pith. Dry flower stalks of Aloe, Watsonia, Gladiolus, Aristea or even the exposed ends of grass thatch of roofs are also used for nesting. This can be observed in the thatch roofs of many chalets in game reserves in South Africa. Within the allodapines there is much variation in behaviour between species with an intergradation from purely sub-social forms, to semi-social, or primitively eusocial colonies. 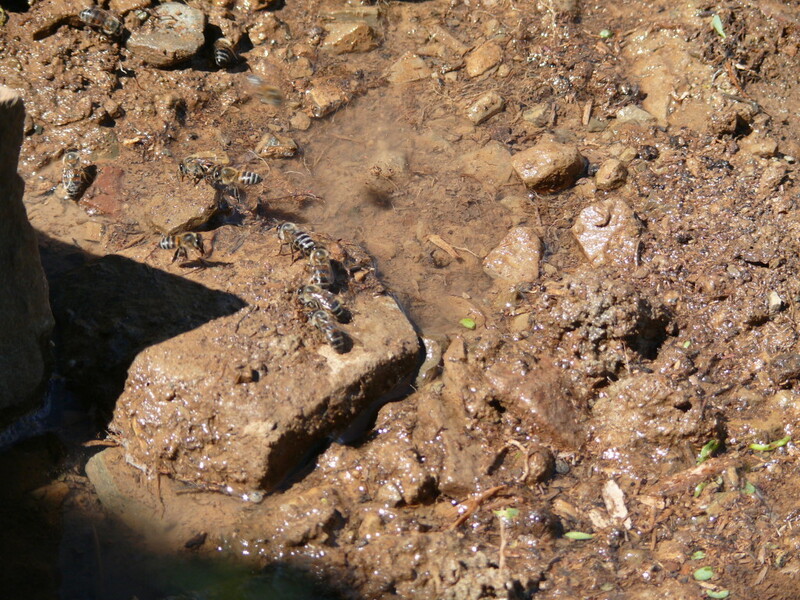 Sub-social associations consist of one female and her progeny. Eusocial is where there is a reproductive division of labour where the worker caste cares for the young of the reproductive caste and there is also an overlap in generations so that offspring assist parents. 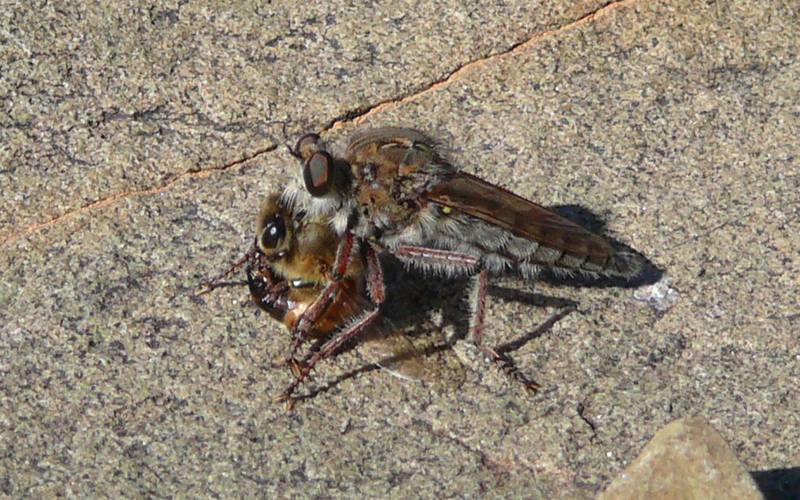 A typical case study of allodapine ecology is that of the eusocial Allodape angulate by S.H. Skaife in the Cape Peninsula. 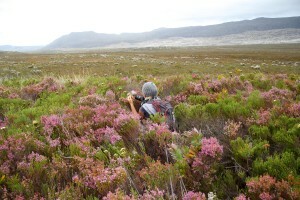 In the winter rainfall region of South Africa adults of the new generation emerge in the middle of summer (end December to February) but remain largely quiescent through the remainder of summer and then disperse in autumn to found new nests. Breeding takes place in July and August and the solitary females begin new colonies. 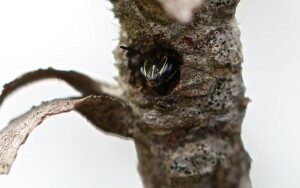 After removing the pith of a broken stem and constructing a burrow, the adult allodapine female usually modifies the entrance to the stem by restricting it by building a collar of chewed pith to fit her size. 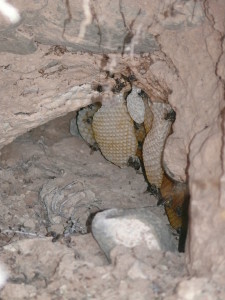 This nest is then defended either with her head or with her tail end which contains a powerful sting. The nests of allodapines do not have partitions like those of many other genera in the Xylocopidae, but larvae of different stages of development are reared together in the same tunnel. 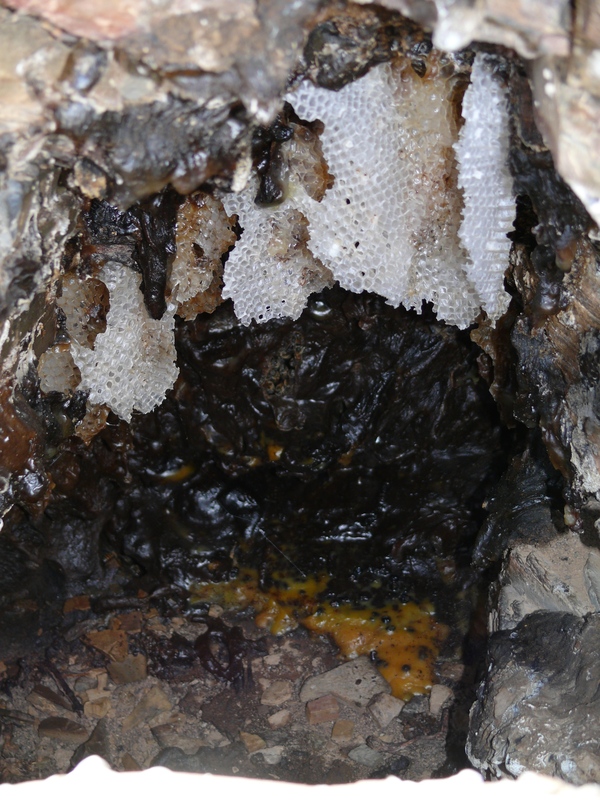 Several eggs are laid at the bottom of the tunnel which may be as deep as 14 mm and on hatching the female collects nectar and pollen which she forms into a paste. This she places near the head of the larva, and as it develops it is fed progressively. 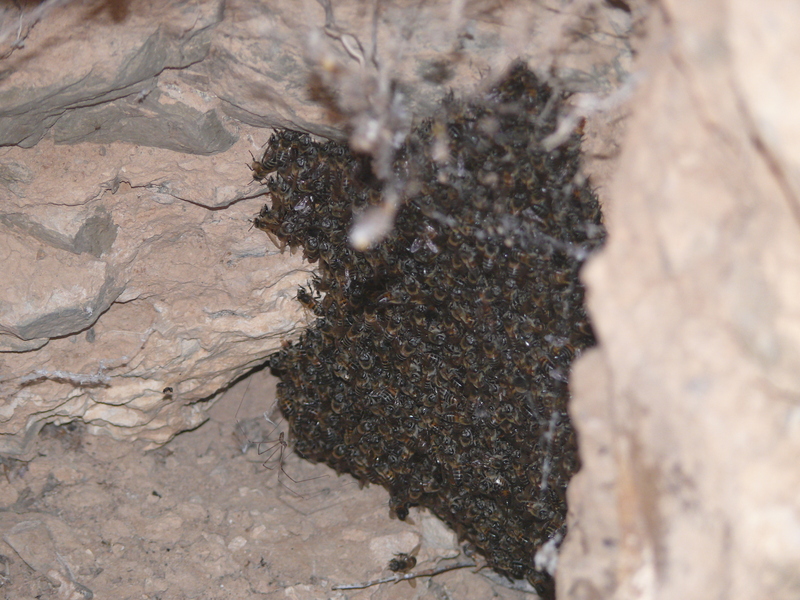 As more eggs are laid, the larvae are re-arranged in the tunnel with the oldest nearest the entrance. 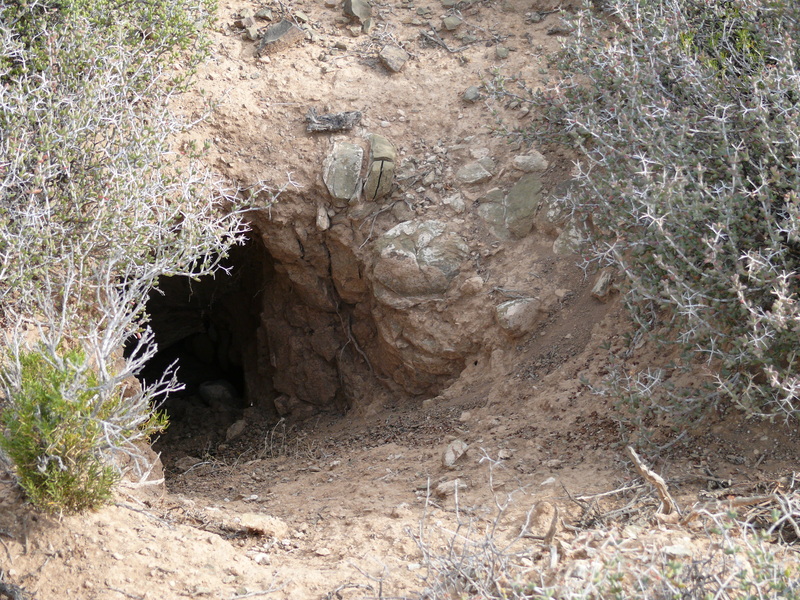 Excrement is systematically removed and the tunnel may become stained with pollen. Pupation takes place in November – there being no pupal cocoon, with the pupa merely lying loose near the entrance. Development from hatching egg to adult takes 14 to 15 weeks. When her progeny, both males and females, become adults, some may leave to form their own nests but a few females remain with the old female while assisting in the rearing of the young. Hence the term ‘sub-social’ for the assembly of the old female with about four female progeny over several months. There are many variations on the above nesting behaviour according to the species involved. 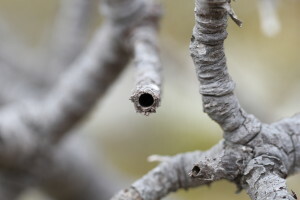 Allodapines can be induced to nest in artificial drinking straws or in a bunch of broken pithy stems of a plant with diameters of less than 10mm tied together in a bundle and attached to a peg in the ground. Such bundles of nests can then be moved to a shady and dry place where they may be monitored. 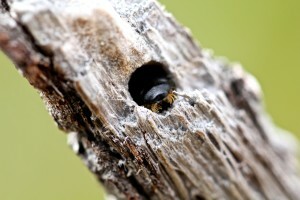 Some bees can be induced to nest in clear straws kept in shade and out of direct sunlight where they may be viewed in situ. Allodapines are usually observed on flowers consisting of a multitude of small flowers on one head where the pollen is found readily on the surface. Such flowers are less regularly visited by the larger honeybees and carpenter bees and are invariably yellow. An example of such a flower is Cotula coronopifilia or ‘gansgras’ (Asteraceae). Michener, C.D. 1974. The Social Behaviour of the Bees. The Belknap Press. 404pp. Skaife, S.H. 1979. African Insect Life. C. Struik Publishers. 279pp. This entry was posted in Uncategorized on January 23, 2015 by ujubee. When a capensis colony loses her queen, the older bees start attacking the younger, predominantly fuzzy, bees. 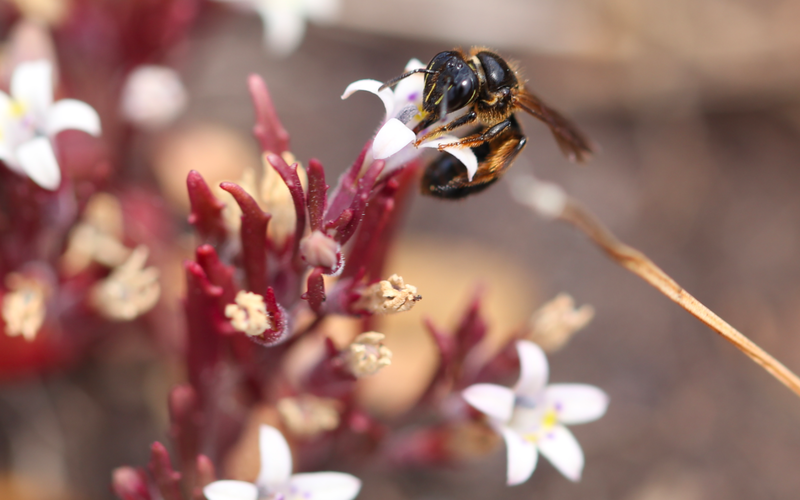 Chattiing to Dr Geoff Tribe about this phenomenon, Geoff revealed that in about 75% of the time this is what’s happening because the younger bees still have pharangeal glands that can produce protein, and so they can more readily develop their ovaries to lay eggs. What we observed, is that these bees being attacked become submissive, but try to scoot away if they get the chance. Geoff’s theory, and it’s an interesting one, is that the other 25% who become laying workers in the older age group, lay only drone eggs. 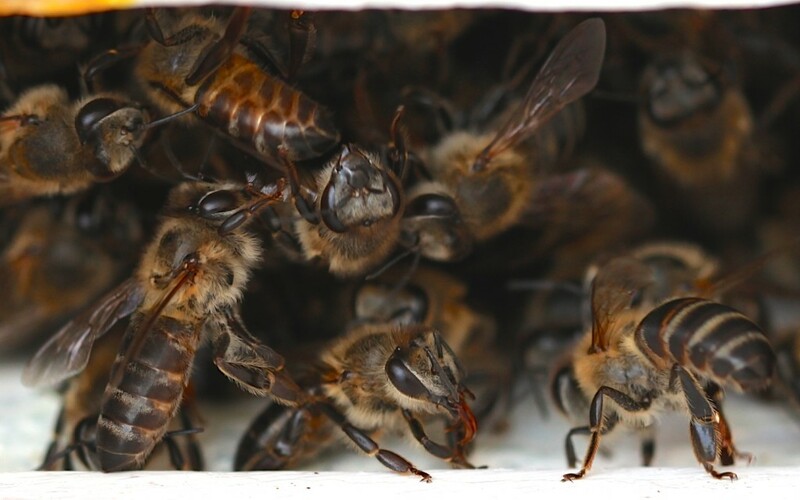 What is happening with all the fighting and killing going on in the capensis colony, is that the older bees are responding to too much queen pheromone in the hive and need to eliminate the excess queens. 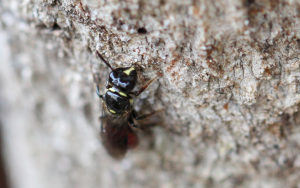 But they find workers who are producing queen pheromone to a greater or lesser degree. They pull around and harass those with low amounts, and then sting those with larger amounts. Reading through various research done on Cape honeybee behaviour, those bees with larger amounts of queen pheromone are often the 8 day old bees. 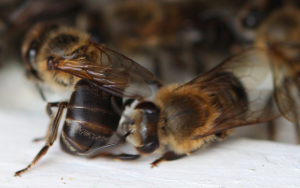 The bees which eventually become the laying workers are those which were able to evade the ‘aggressors’ and become pseudo-queens whose pheromone level is as high as that of a queen and are able then to repel these aggressors chemically who then form a ‘court’ around her. During this phase of fighting, which can last several days, one can hear a high-pitched ‘piping’ of the victims in distress. In a capensis colony, potential laying workers are ready to fully develop the moment the queen is lost. The more ‘capensis‘ it is, the faster they requeen and the lower the slaughter. Construction of emergency queen cells can begin immediately. They build a queen cell around a 2 to 3 day old egg laid by the lost queen and rear it on royal jelly until it emerges as a queen. 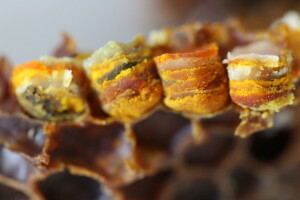 The Cape bee under such circumstances only rears two or three queen cells, whereas scutellata may have 40 emergency queen cells on one frame – usually in rows at the bottom of the comb. 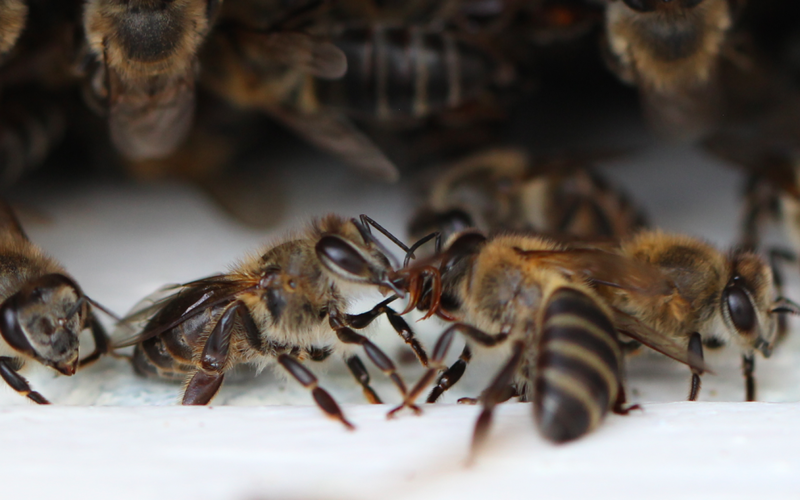 If the colony is completely queenless and has no eggs from which an emergency queen can be reared, the laying workers will take over. 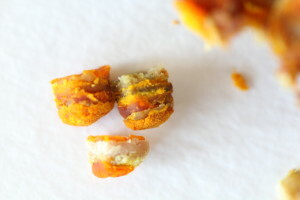 Once there are ‘functional laying workers’ in the hive the bees will begin constructing one or two queen cup cells. These are highly attractive to laying workers – Geoff, in his research, counted 64 eggs in one and they were filled up again the next day – and from an egg laid by a laying worker in this cup, a queen will be reared, will leave on a mating flight and will return to lay eggs as normal. This entry was posted in Uncategorized on January 18, 2015 by ujubee. 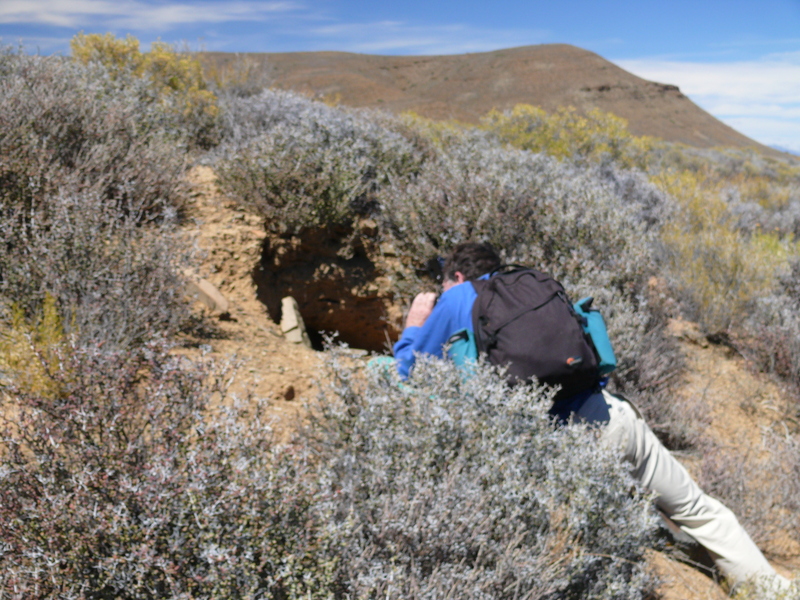 Four nesting sites have thus far been located on a 900ha farm in the Succulent Karoo north-east of Touwsrivier (33° 21’S 20° 03E). 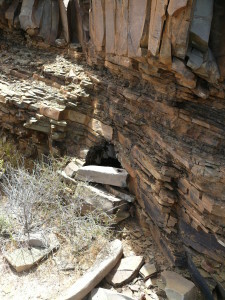 Two of the nests were found under shallow overhangs on rocky ridges, one that occurred alongside a dry river course and the other in the foothills of the surrounding mountains. 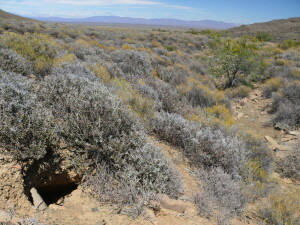 The other two nests were located deep in deserted aardvark burrows, one just above a dry water course and the other on a plateau. 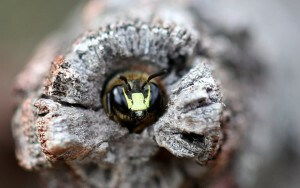 Where honeybees nest is largely determined by the environment in which they live. While winter temperatures may plummet as low as minus 4°C, summer temperatures of 41°C have been recorded on the farm “Zoethoek”. 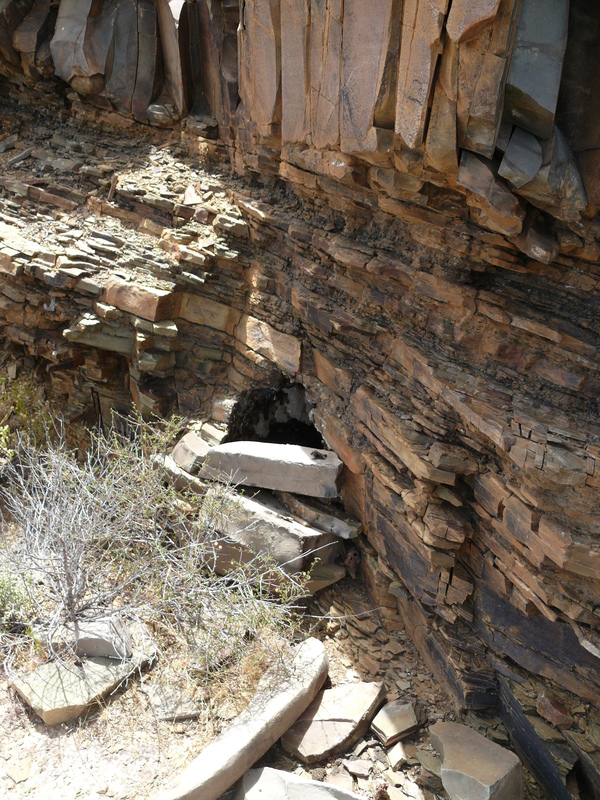 Crumbling shale forms the dominant rock formations which is not conducive to the formation of cavities or small caves, and hence the relative dearth of rock-rabbits (dassies) on the farm who prefer to live among boulders. The average rainfall for Touwsrivier is 240mm, of which most falls during the winter months, but rainfall may be fairly erratic. 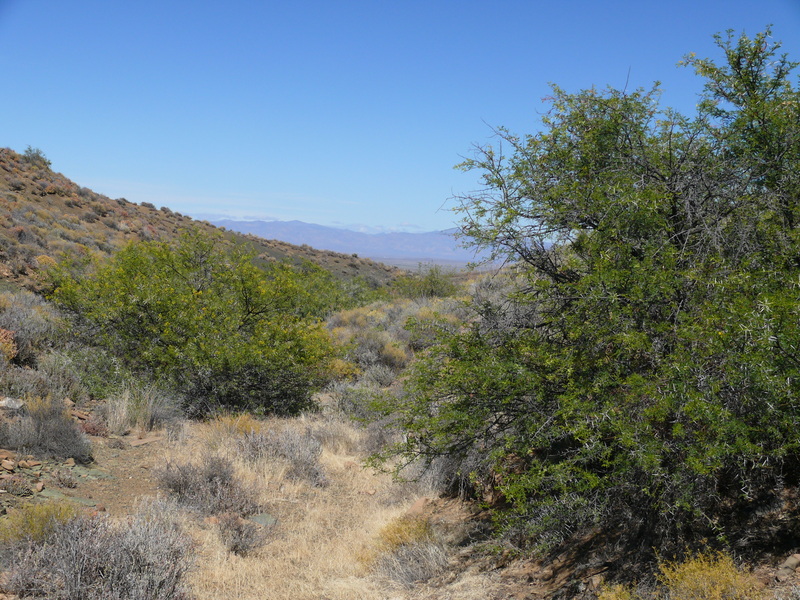 The dominant trees, almost all of which occur along the dry water courses, are Vachellia (Acacia) karroo, Searsia (Rhus) lancea and Searsia undulata, none of which could provide nesting sites due to their small stature. Vachellia karroo is only one of two plants flowering on Zoethoek in January and hence attracts a myriad insect species from bees, wasps, flies and beetles of many species, including the fruit chafer Rhabdotis semipunctata (F.). The only permanent water is to be found in a reservoir served by a windmill on the eastern border of a neighbouring farm at which honeybees are invariably seen collecting water. 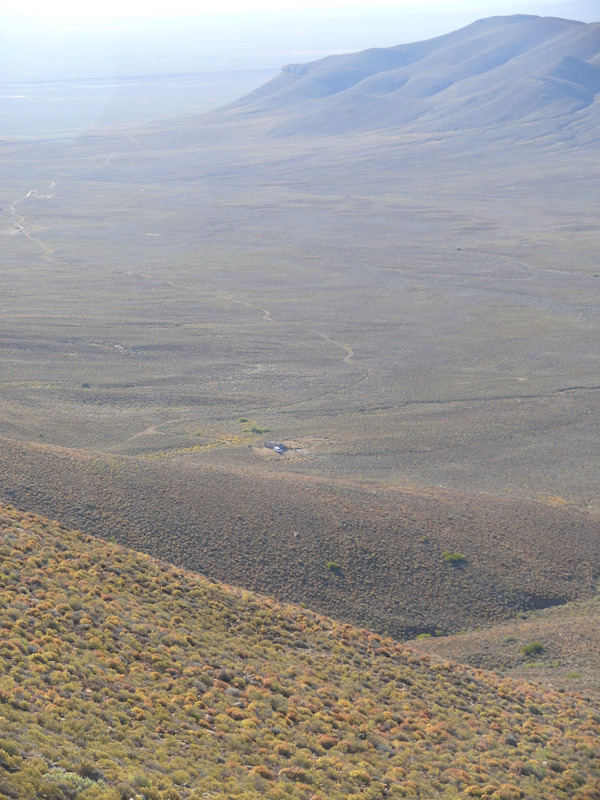 The highest mountain rising above the plains at 800m above sea level is the Rooiberg at 1052m. Shepherds in the past had constructed a rudimentary cairn of rocks about the nest under the overhang alongside the river course presumably for some protection of the nest against the elements, and one reason for this could be to ward off the intense summer heat. When the second nest was discovered (also with a partial cairn of rocks around it), the wax and propolis had melted presumably due to the intense heat and the bees were present in very low numbers at the very rear of the cavity. 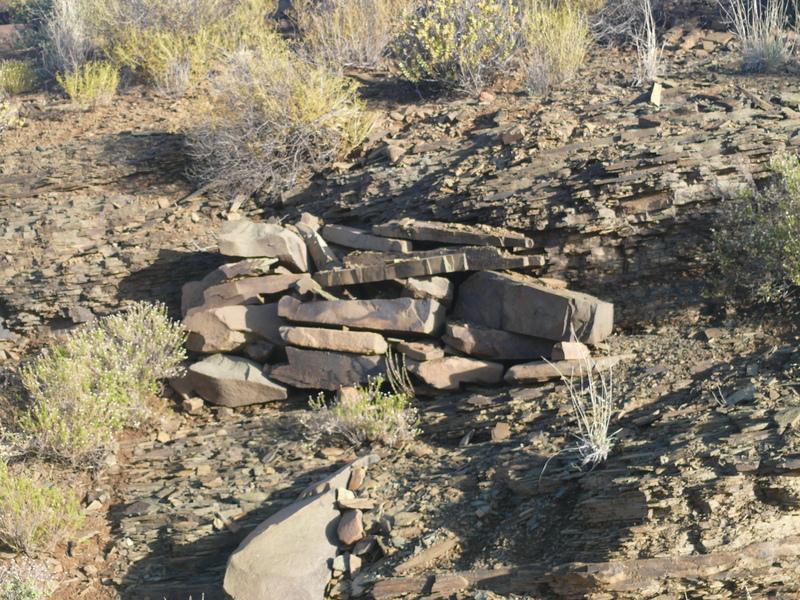 Possibly it was not only the atmospheric temperature which was to blame, but also the heat accumulated in the rocks themselves, because any rock that is picked up is extremely hot. During the hot summer months water becomes essential to cool down the nest – forcing honeybees to collect water from a leaking pipe when the temperature was 36°C. It appears that nesting in aardvark burrows is perhaps the best recourse for the honeybees. There is always the potential danger of the burrow being flooded but rainfall in this region is meagre. 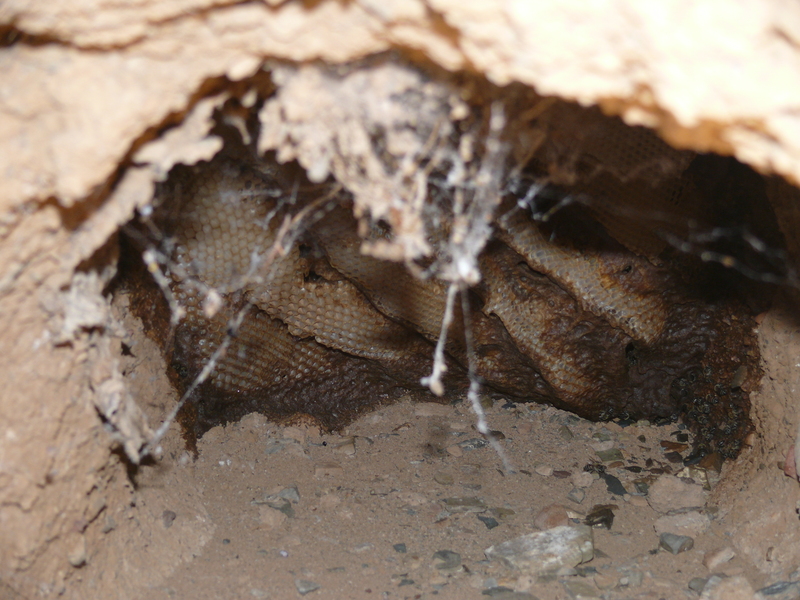 Nests deep in such burrows are less affected by extremes of temperature and the bees are better able to control the humidity within the nest. 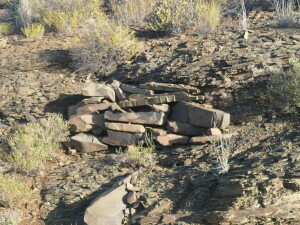 The nest on the plateau has been there for at least a year and appears to be thriving. 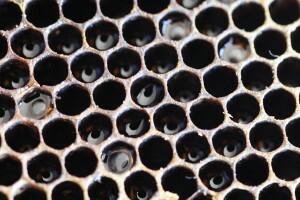 The photo of bees clustering about their combs was taken at 06h00 at a temperature of 14°C. The water course colony had used the outer combs to form a ‘wall’ which they had propolized together, restricting the entrance and so effecting better control over both temperature and humidity. 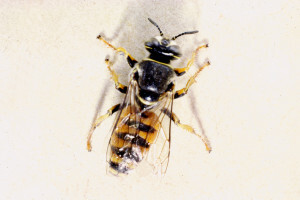 When this nest was discovered, a loud ‘moaning’ sound emanated from the burrow – a sound which is heard when honeybees are plagued by the banded bee pirate wasp, Palarus latifrons (see photos below). All the nests on the farm had banded bee pirates in attendance outside their nests which catch incoming or exiting bees and bury three paralysed bees in a specially constructed burrow and onto which they lay a single egg. The hatching larva then feeds on the bees. Up to 80 banded bee pirates have been counted around a bee hive in the Swartland, with a female wasp capturing a bee every 10 minutes or so and provisioning many burrows. The bees become so intimidated that they refuse to leave the hive and set off a ‘moaning’ sound, the reason and effect of which is as yet unknown. Does it warn the foraging bees of the imminent danger or threaten the wasps to keep their distance? How is this knowledge of danger transmitted from the foragers to the rest of the hive as this ‘moaning’ sound is restricted only to the presence of the banded bee pirate? How is this sound produced – and from which part of the bees’ body? 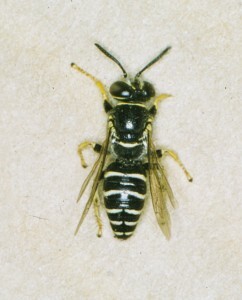 To have this sound produced by the entire colony indicates the extreme danger that these wasps present to the honeybees. Often, as the sun sinks and the banded bee pirates depart for the night, the honeybees make a desperate effort to collect nectar and pollen before night falls. Sometimes the colony begins to starve and is forced to abscond. Tape recording the ‘moaning’ sound and playing it back to honeybees in an observation hive to elicit a response could possibly help determine the effect of this sound on the colony. 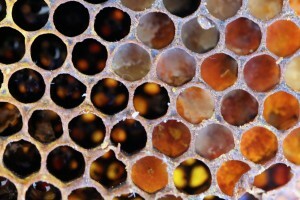 The frequency of the sound may be just as important because many sounds produced within the hive are carried through the substrate. 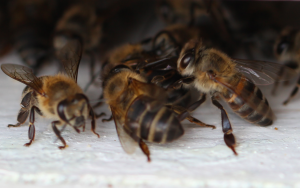 For example, the movement of a ‘piping’ queen in an observation hive can be followed on the other side of the comb by the path of ‘frozen’ workers. One effect of ‘piping’ is to ‘freeze’ the workers around the queen, a mechanism used also by the death’s head moth (Acherontia atropos) when entering a hive, but in this case the sound is not produced by the wings but through the moth’s proboscis. 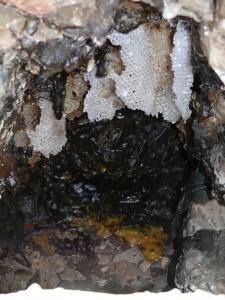 Many more honeybee nests have yet to be discovered on the farm as bees collecting water leaking from a damaged pipe indicate the presence of other colonies in unexplored parts of the farm. Most of the bees are dark and appear to be Apis mellifera capensis, and the farm does fall within the winter rainfall region, albeit on the northern margin of its distribution. A determination of the number of ovarioles of a sample of worker bees would confirm whether they are Cape Bees or Apis mellifera scutellata. Because no honey badgers (ratels) have as yet been observed on the farm, only baboons, banded bee pirates, and robber flies (Asilidae) appear to be the only creatures that threaten the existence of the bees. 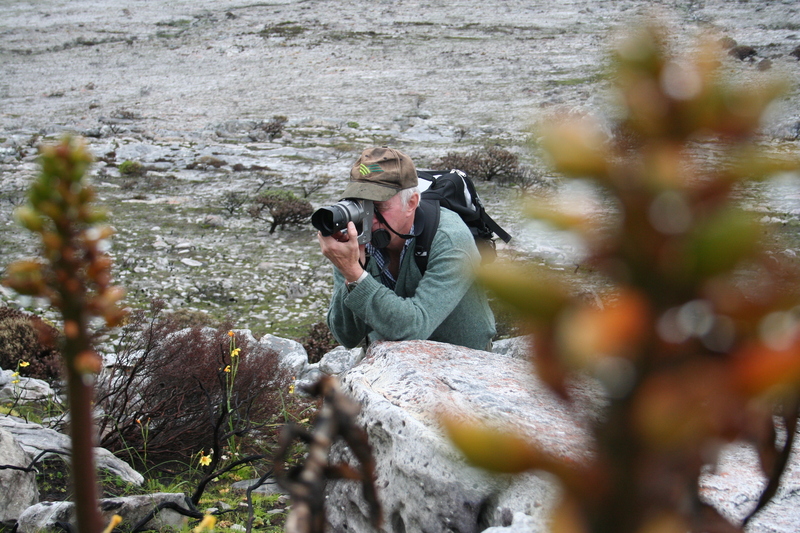 Dr Geoff Tribe is a Specialist Researcher – Entomology, Plant Protection Research Institute (retired), has done research on dung beetles, honeybees, forest entomology, slugs & isopods and is our project mentor. Dr A David Marais is a Professor in Chemical Pathology at the University of Cape Town Health Science Faculty. Both Dave and Geoff have a mutual interest in the Stapeliads – the carrion flowers which emit a stench and are pollinated by a variety of flies and not by bees! This entry was posted in Uncategorized on January 16, 2015 by ujubee. This entry was posted in Uncategorized on January 9, 2015 by ujubee. 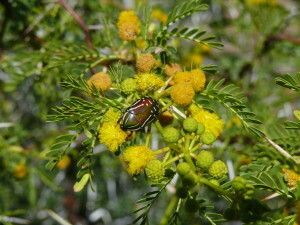 One of the great advantages of being out and about in the fynbos, is that one can observe what the bees are feeding on. This varies depending on the time of day and is obviously dependent on what is currently flowering. Nectar is sucked up through the bee’s proboscis, or long tongue, and it fills its honey stomach. Back at the nest this is then passed on to the house workers and used for the production of honey and beeswax. 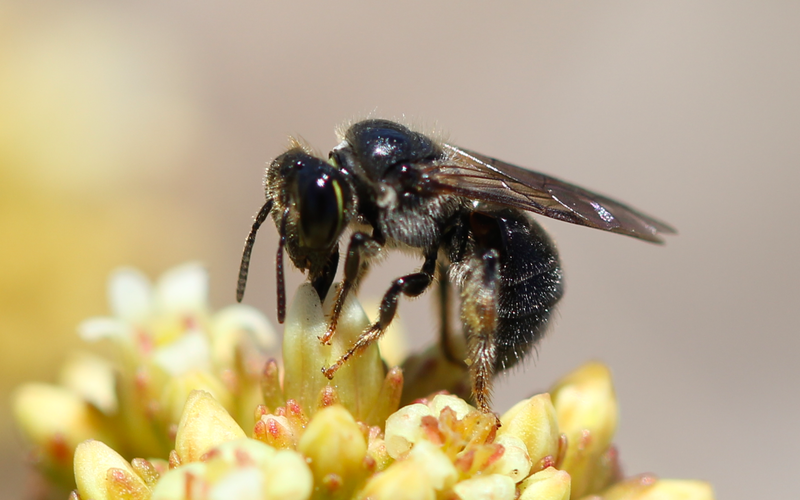 When bees visit flowers, pollen is scattered all over their hairy bodies. The bee combs it down and packs it tightly into their pollen baskets situated on their hind legs. What is not collected together is carried to the next flower to pollinate it. The work that the bee does as a pollinator is purely involuntary, but magical. 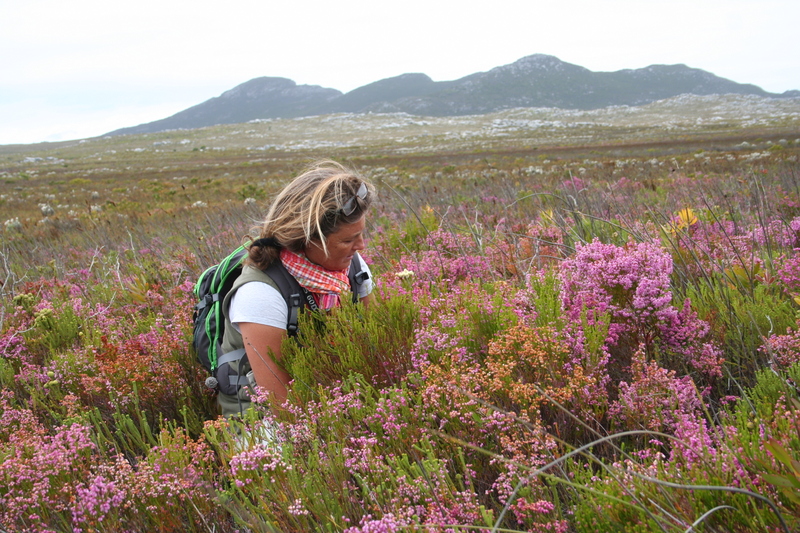 85% of the fynbos is pollinated by honeybees! nectar, pollen and mixtures of the two. It can be downloaded here. Nicolson’s paper is a review of the chemistry of the floral resources, nectar and pollen. It is a fascinating article for anyone interested in the nutritional value of both to the bees, and raises the question as to whether we, as humans, can actually digest pollen nutrients. Pollen granules are becoming ever popular in Health shops. Bees are herbivorous, consuming nectar and pollen throughout their life cycles. 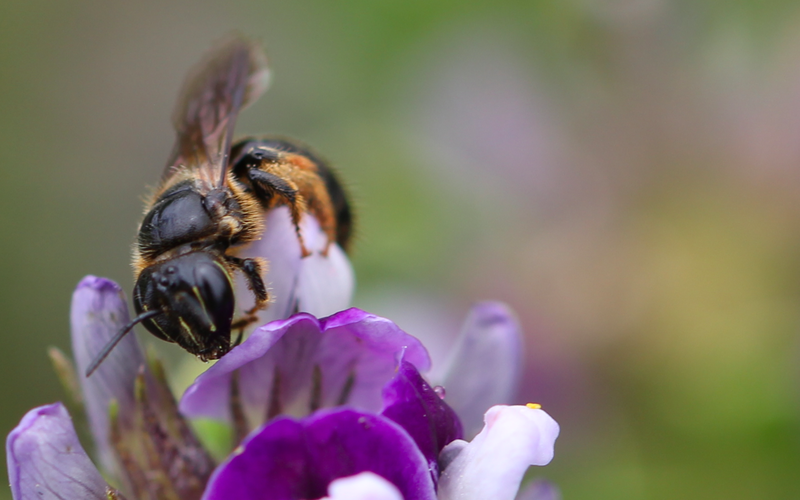 Nectar is the main source of energy for the bees, containing mostly sugars, but also may contain various minor constituents of nutritional significance. Pollen provides bees with the protein, lipids, vitamins and minerals essential for larval rearing and development. In honeybees, pollen consumption is highest in young adults, enabling their hypopharyngeal glands to produce royal jelly for feeding larvae. 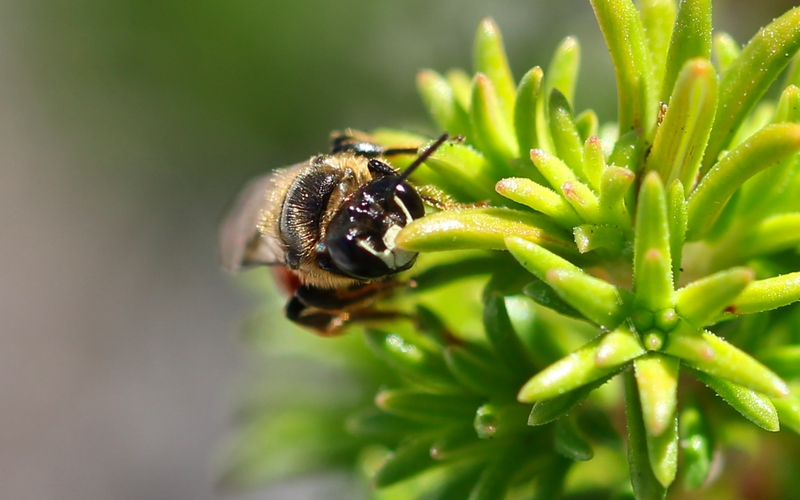 Once the bees transition to becoming foragers at around 14 days, they consume mainly carbohydrate or nectar, suggesting that foraging bees have reduced requirements for protein. 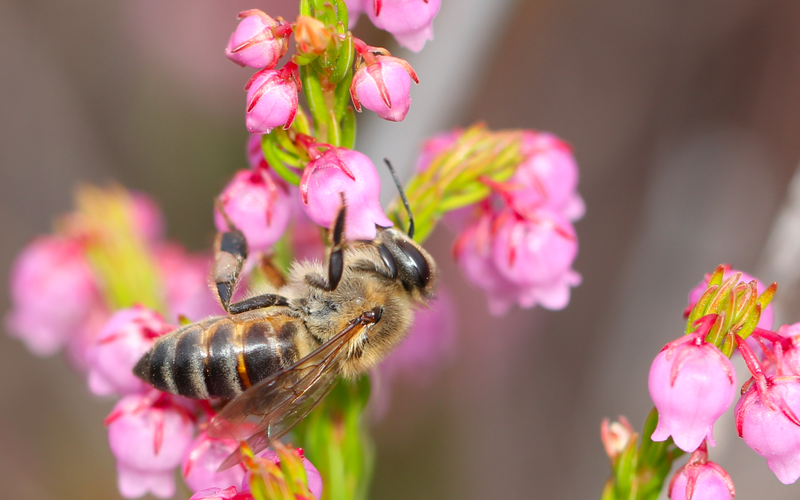 A single wild honeybee colony will harvest 120kg of nectar and 20kg of pollen annually. 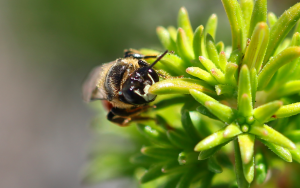 There are differences in composition and nutritional value of bee-collected pollens and hand-collected pollens, as honeybees directly and indirectly begin altering pollen composition right from the first contact. Energy content is directly related to its volume and sugar concentration. Nectars rich in sucrose (flowers of the Lamiaceae family) and hexose sugars (sunflower, canola, Eucalyptus species) are highly attractive to bees. Amino acids, present in high concentrations in nectars of Erythrina and Aloe. Caffeine is present in Citrus nectar which is highly attractive to bees! 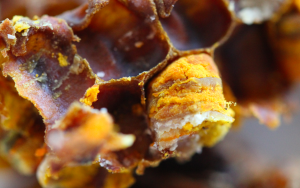 When honeybees pack pollen into their pollen basket, the addition of nectar enables them to transport pollen grains varying in size and surface texture. 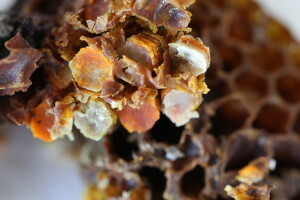 More nectar and glandular secretions are added in the hive, and microbial inoculation leads to fermentation during storage, forming bee bread which has higher nutritive value than bee-collected pollen. 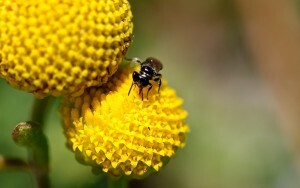 Protein levels in pollen vary widely. Sunflower pollen is considered to be of poor quality for bees because of its low protein content after collection by bees. 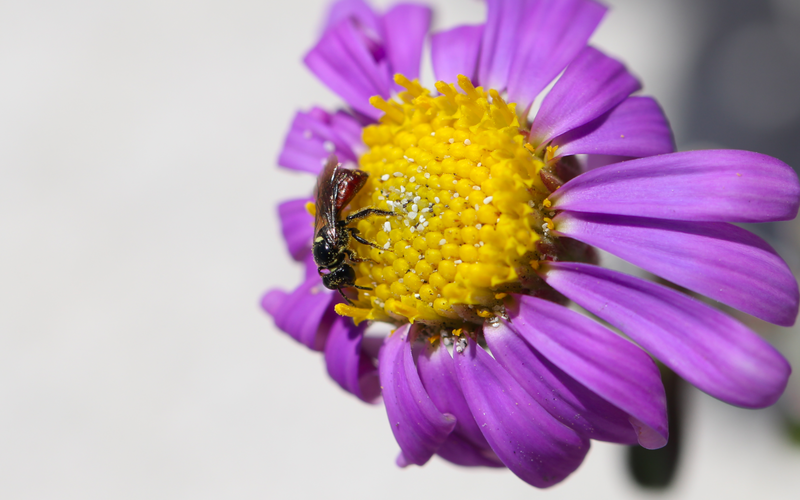 Amino acid composition determines the amount of pollen required by bees, more than its protein content. 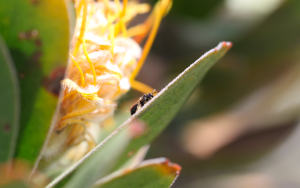 Bee-collected pollens of Eucalyptus species are deficient in some amino acids, suggesting that bees will not do well on an exclusive diet of Eucalyptus pollen. Nicolson notes, that from an evolutionary viewpoint it makes sense for bees to be more discriminating in their choice of pollen sources: the pollen is needed on a short-term basis for larval rearing, whereas the colony requires full honey stores to survive adverse conditions. Diversity in bee diets may be necessary to avoid nutritional deficiencies and to dilute toxins, but need not involve many plant species. Pollen is usually collected from 5 – 9 plant species at a time, with mixed pollens being better than single pollens for maintaining honeybee immune systems. It seems that much more research on pollen and nectar sources still needs to be done in South Africa. 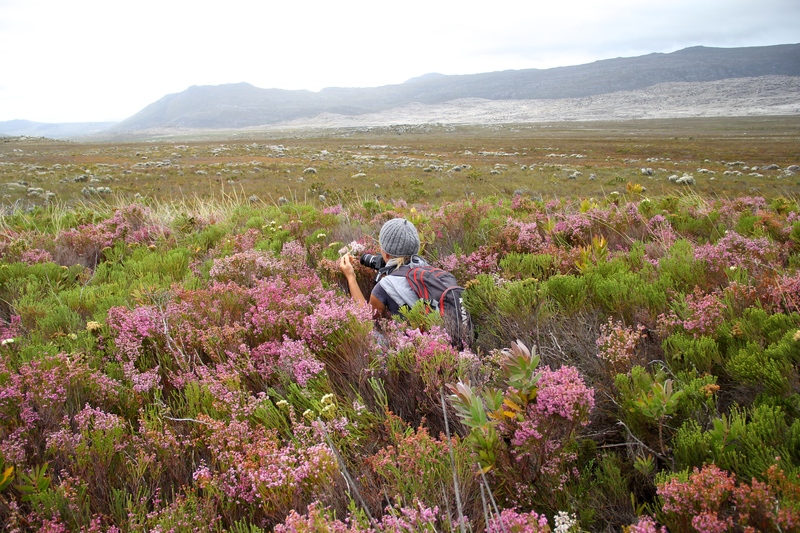 Hopefully with our observations in the fynbos, we can make a small contribution, too, to the preferred bee forage. This entry was posted in Uncategorized on January 5, 2015 by ujubee.